23 July 2005, 11:18 am. Highpoint #35. 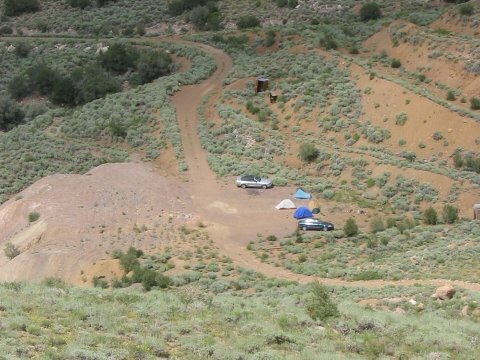 On 22 July 2005, Jim Buckley (Colorado), John Gallen (Pennsylvania), along with Tom Buckley (Mexico City) and myself (Mark Kness, Austin) set out from Las Vegas, for a drive through remote Nevada. 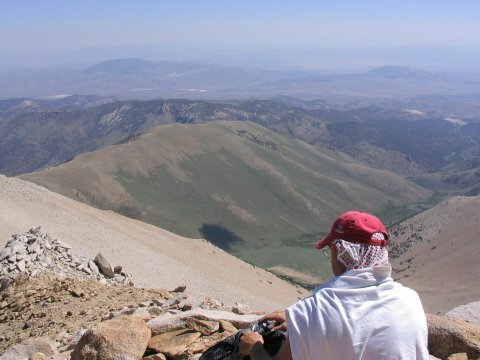 Our objective was Boundary Peak, the highest point in Nevada. Some maps and waypoints for our route, Queen Canyon Mine, showing GPS tracks from our hike over topographic maps, are here. The total distance was 10.5 miles round-trip, with a net elevation gain of 4040 ft, and a total gain slightly more than that. This part of Nevada felt really remote. Remote as in compared to West Texas. We started out northwest from Las Vegas, on US 95. Soon, we made a short detour through Red Rock Canyon, where we got to see some nice scenery, followed by thunderstorms and brush fires started by the lightning. Then we returned to US 95, and continued northwest through the desert. Soon we started to pass Nellis Air Force Range. This enormous military zone was specifically picked to be in the middle of nowhere. It is the home to such things as the Area 51 aliens, secret flight test facilities, the nuclear test site, stuff like that. Just outside of Clark County, we passed the 'town' of Mercury, just inside the military complex. All we saw was a very well constructed highway leading past some guard buildings to a town off in the distance. The only road in the complex that was on my road map was this one, presumably the 'public' face of the military zone. Many strange things have probably passed through those gates, over the years. After we passed by this, we drove on really into the middle of nowhere. We stopped at Amargosa Valley, taking advantage of a rare bit of shade over a picnic table out in front of a small store. The store had plenty of alien-themed kitsch for sale, but we mainly wanted the shade. The high in Amargosa Valley was probably around 120 F that day, so we were plenty warm as we munched on a salami-cheese-cracker lunch. (I ate more than my share.) After this break, we continued northwest along US 95, through Beatty, and then west on SR 266 to Oasis CA, then north on SR 264 through Dyer and to US 6 near Montgomery Pass. I had read several trip reports of nearly running out of gas, so we made sure to refill at Beatty and Dyer along the way. At Dyer, the pump didn't take credit cards, and they had to write me a receipt by hand. As we drove, we had a look at White Mountain Peak, a 14er in California, which we thought was Boundary. While stopped in Dyer, some checking with the GPS pointed us to our first real sight of our goal. Once at US 6, we headed west. There used to be a hotel/casino here, Soper's Montgomery Pass Hotel and Casino, and we originally considered spending a night there. It was closed and abandoned, so that didn't work, and we continued towards the trailhead. We were looking for the unmarked, unpaved road that leads to an abandoned mine at the trailhead. Just west of a marked view of Boundary on US 6, about 10 miles west of where SR 360 joined US 6 just before Montgomery Pass, we spotted the road to the left (south), with an abandoned tank with the initials 'J R' on the opposite (north) side of the road. That's the road! 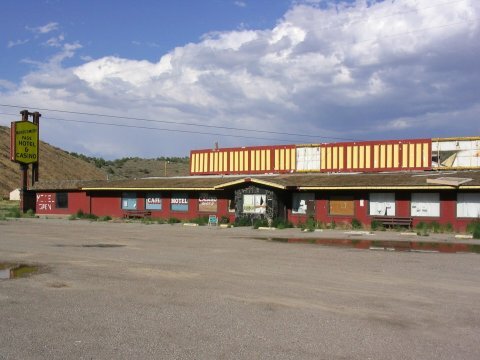 The abandoned casino at Montgomery Pass. This turnoff from US 6 is at coordinates N 37 deg 55.588 min W 118 deg 24.111 min. The rough road travels about 6.2 miles to some old mine tunnels at N 37 deg 53.356 min W 118 deg 19.061 min, at 9107 ft, where typical 2WD access ends. The road continues as a 4WD drive road up to a saddle at N 37 deg 52.854 min W 118 deg 18.881 min, at 9903 ft. This road was somewhat difficult for my Honda Civic. Besides getting slightly stuck once, the car was starting to overheat. After turning off the a/c, and giving the car a little break, we made it ok. I was glad that I didn't just have an idiot light for the temperature, the drive would have been a lot harder to manage then! John's Ford Mustang convertible made it also. We stopped at the end of the 2WD road, at the abandoned mine. 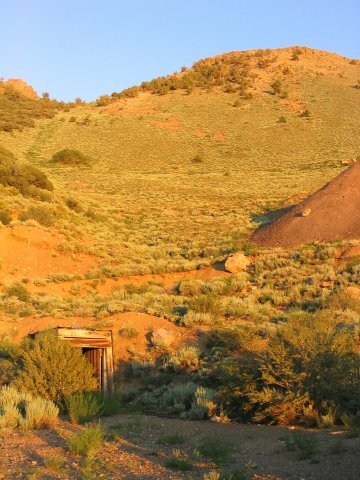 This was a picturesque campsite, with old mine tunnels nearby and a fantastic sunset to come. It was also a little treacherous - there are lots of nails and other debris left over from the mine that could puncture tires (or feet). We were in a very remote area, not a good place for a couple of flat tires! There were also some kind of plants growing on what was probably mine tailings across the road. I don't know, but my speculation is that these were intended to soak up some toxic material. Some plants take up a lot of particular heavy metals, and so remove these elements from the soil. There was plenty of flat space, so we each set up our own tents, with nobody else around at all. There is no water here, we had made sure to have plenty with us. Out in these remote wilds of Nevada (really) we had to rough it terribly (not really). John, quite the camp cook, whipped up some tasty pork chops that we ate while watching the sunset. After that, he pulled out the laptop and started up the Clint Eastwood movie, Hang 'em High. Something about watching this movie in this setting was wonderfully surreal. As the movie progressed, and darkness advanced, we debated which planets we could see, whether it was Mars or Jupiter besides Venus. About halfway through the film, some clouds started to build up, and besides, we had an early wakeup, so we headed to sleep, even before Clint rounded up all the bad guys. 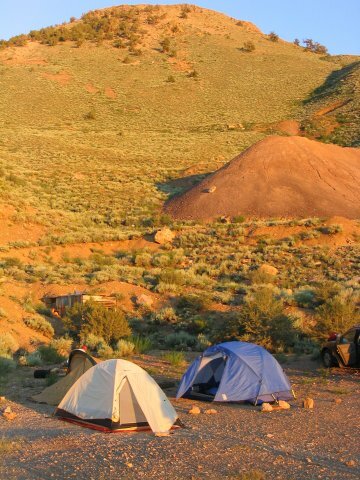 We had a fine sunset as we set up camp at the old mine. Be careful of mine debris! Another view of the campsite, from above on the next day. We started out the next morning at 5:45, hiking up the 4WD road. It was just after dawn, with a nice moon, as we continued up the road until it ended at a saddle. At this point, we saw a cairn next to a blank sign, and an obvious single-track trail, at around 9900 ft, at N 37 deg 52.854 min W 118 deg 18.881 min. We headed up this trail. The trail, easy to follow, switchbacked up to the top of a ridge around 10860 ft, then continued mostly level (slightly downhill) to Trail Canyon saddle. After topping out on the ridge, we got our first view of Boundary. The trail along this section was well defined, and probably helped by the wild horses. They likely used the trails to their own advantage, and so helped pound them out. They also left many cairns of horse apples! 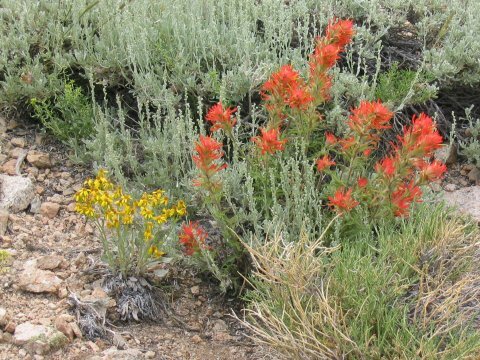 We didn't have that much sagebrush to battle with. Before the 4WD road ended, it was irrelevant, and soon after we were at too high an altitude, so there was only brush for a quarter mile or so. 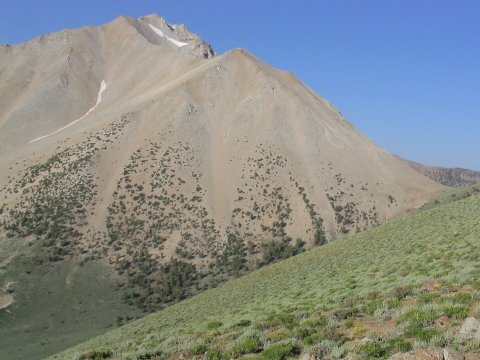 The Trail Canyon route, another approach to this peak, sounds like it deals with much more brush, and a more indistinct trail, than this Queen Canyon Mine route did. The two routes converge at Trail Canyon saddle, which we reached around 8:30 am. A first peek at Boundary, as we topped out on the first ridge. 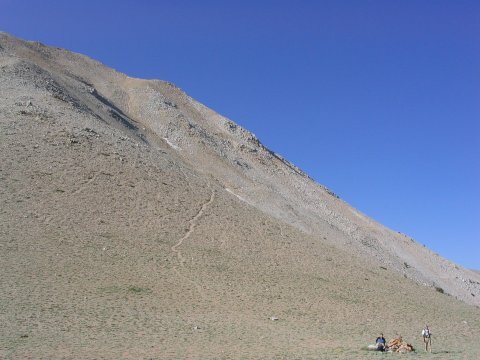 onto the ridge, heads left and up, then makes a final right turn at the next ridgeline to the Boundary Peak summit. Montgomery Peak, the actual summit of the mountain, is out of sight behind Boundary in this photo. We set off gradually downhill towards Trail Canyon saddle. 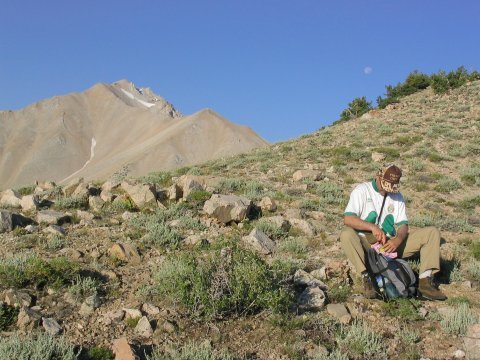 Jim wasn't feeling well, and so he let Tom, John and I deal with the pile of scree beyond Trail Canyon saddle. From there, various use trails head up P-12110 (a.k.a. 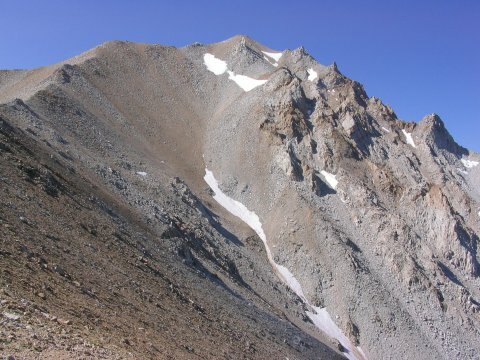 'the scree-pile'), towards a saddle to the right of its summit. I had expected more in the sliding-back-with-every step category up the scree, but we kept our position fine. The loose gravel did make each step a little treacherous, and few of the rocks were solidly placed, so we had to be careful. From that second saddle, the trail heads left (east) across the face of P-12110, towards the ridge on the south side. 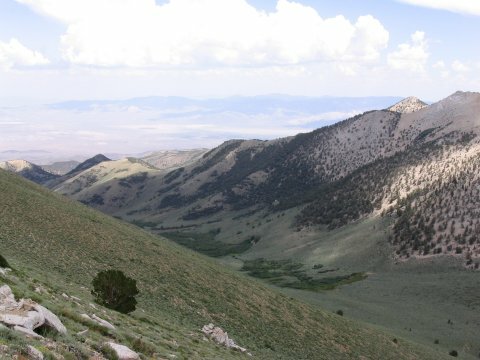 It follows the ridge south, then southwest, bypassing steeper rock on either side via boulder-hopping, until reaching the highest point in Nevada. There were a number of cairns on paths through the boulders, but no official trail. Jim and Tom at Trail Canyon saddle, with P-12110, a.k.a. 'the scree-pile' behind them. The use trails head to the saddle area right of the top of P-12110. From the scree saddle, a view of the remainder of the route. The trail heads left, skirting P-12110, then right up the ridgelines to the summit. 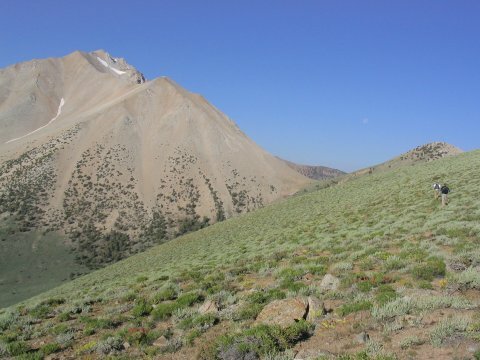 Montgomery Peak is still not visible behind Boundary Peak. John taking one last rest break before the summit. 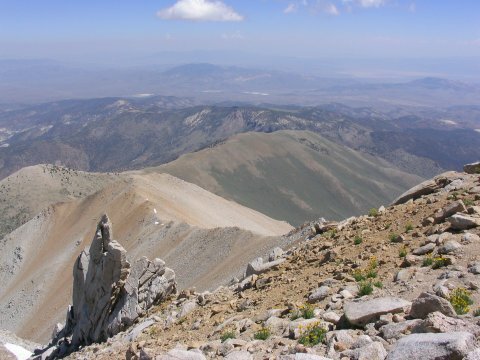 From there, you finally can see the actual summit of the mountain, Montgomery Peak in California. 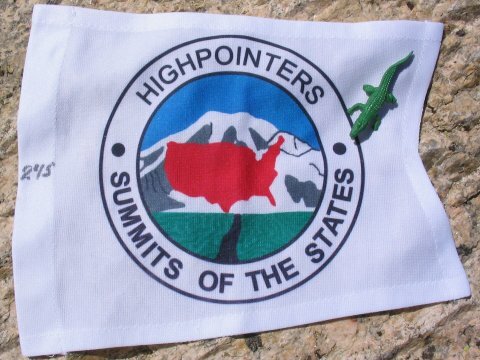 If you are after the state highpoint, as we were, California doesn't matter, and you are done! We had lunch, read the summit register, and took some pictures. I recognized Targo Tennisberg in the register, I had used his webpage for driving directions before. 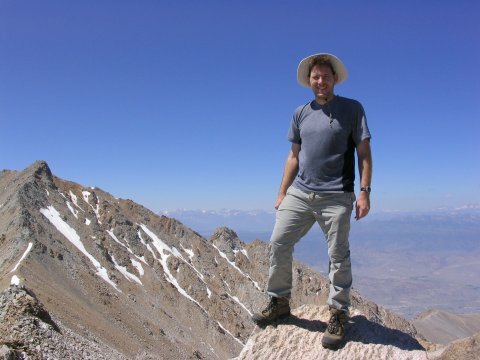 This was my 35th highpoint, Tom was in double digits with 10, and, remarkably, this was John's first high-altitude hike, not an easy one at all! A great warm-up for Whitney, all around. The views of the California Sierra, off in the distance, were nice, and we had a great view towards where we had come. 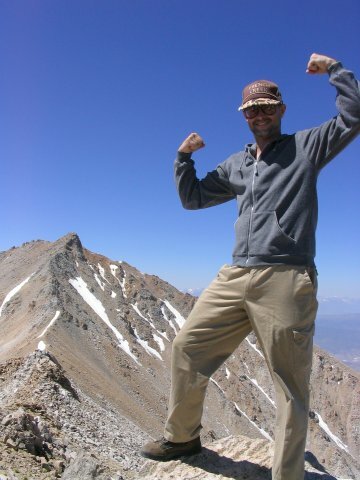 Tom on top of Nevada, with the obviously higher Montgomery Peak in the background. A few register entries mentioned a crocodilian on top. I didn't see the one mentioned, but fortunately I brought my own. then right along the green ridge, then over and behind it then further down to the campsite. but it is in California so we didn't care. We did not attempt this traverse. After about an hour on top, we set back (carefully) down the boulders and scree towards Trail Canyon saddle, where we rejoined Jim around 2 pm. Until this time, we hadn't seen another person anywhere on the route, either on the unpaved road or the trail. Just as we started back to our camp, we passed two hikers on their way to Montgomery. The trail, easy from here on, ascended gradually to the head of the ridge, then down to the 4WD road, then down further to our camp. 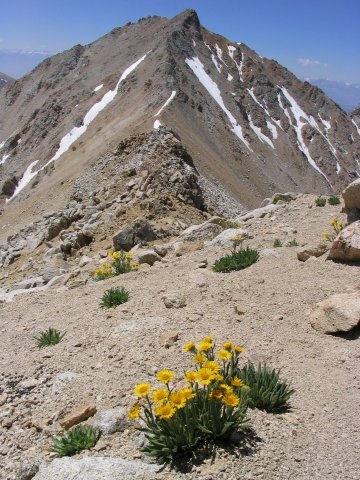 We saw a second group driving up the 4WD road as we descended it on foot - they too, were on their way to Mount Whitney. Looking down Trail Canyon on the hike back. Upon returning to our campsite, we were concerned about clouds building up. The road back to US 6, already poor, would be no fun after a heavy rain, so we hurried to take down camp, and drove out as soon as we could. We went on to Bishop CA, where we had one last nights stay in a motel before continuing on to Whitney Portal. I thought this hike made a good companion to Whitney, and the solitude on this hike was a dramatic contrast to the crowds on the Main Mount Whitney Trail.